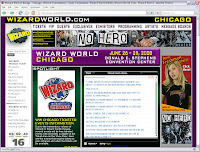 As I've noted before, I'll be attending Wizard World Chicago this Saturday. As it's a decent-sized convention, and I'll only be there for one day, it seems to me that some planning will be required. In doing so, though, I thought I'd share some of my thoughts for how I go about doing that, utilizing the technology available to just about anyone here in the States. Figure out who I want to see and what panels to attend. Not surprisingly, much of this information is on their web site. (Although I personally would've liked to have seen more of it go live much sooner! But I'll take what I can get.) They've also put out a copy of their Program Book on the site in PDF form. It has much of the same information as the web site, but in a more print-friendly format. This step is actually a bit more tedious than it might seem. Some of the big name guests that I want to see (Erik Larsen, Warren Ellis, etc.) are easy to pick out of the list. They've been around for years and are currently producing recognizable work. More difficult, however, are the folks tucked back in Artists' Alley, whose work I may have seen but perhaps not in several years and their names don't necessarily jump to the forefront of my mind. So I go ahead and run searches on every creator who'll be attending. Personally, I use ComicBookDB.com for these searches because a) the results are limited to published comic book work, and b) I can cross-reference the creators' works against what's actually in my personal collection. Once I've compiled of list of who I want to see, I need to determine where they'll be. Since they provide us with a floorplan which includes booth numbers, as well a listing of the booth numbers creators will be using, I cross reference the two and annotate a copy of the floorplan with the names of people's booths I want to hit. The floorplan was provided as a PDF, so I simply used Adobe's built-in "Callout Tool" to identify where everyone will be. I've also studied the map to make mental notes on restroom and food availability. Going back to ComicBookDB.com, I use their "User List" feature to generate a list of books I want to make sure to take with me to the show for creators to sign. I call out each issue as well as the creator(s) who worked on it and will be attending the show. Personally, I limit the number of books I ask a creator to sign to three. Since I'm more interested in having a conversation with the creator over the actual signatures, I feel that three books provides a little unspoken feedback on the types of their work that I enjoy and appreciate. One or two books could be just a particularly good issue, whereas three sets more or a pattern. More than three starts to get tedious for them, I'm sure, and doesn't add anything extra for me. The autographs, in my mind, are more significant as a memory of the conversation I had with them than as an increase in the value of the book. Of particular interest on ComicBookDB's User Lists is that they are editable. I can pick out a dozen books that one creator might've worked on, but then winnow the list down later without having to write out a new list. That way, I can keep returning to the list easily over the course of a week. If I remember some obscure book while I'm at work (or at home or sitting in Panera having lunch or...) I can add it to my list quickly and easily. 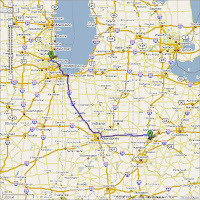 Of course, at some point, it would behove me to figure out exactly HOW to get from my home in Southwest Ohio to the convention itself. Enter Google Maps. I booked my hotel prior to most of the other steps, but my reasons for going to Chicago aren't exclusive to the convention (which is why I'm only attending on Saturday). This time, I tried booking using HotWire.com and got a decent rate at a nearby Sheraton. It turned out to be JUST far enough away from the convention center that I won't really be able to walk to it, especially in the summer heat, but it's considerably cheaper than my last few stays in the Chicago area. The S.O. did the actual ticket ordering, but it was done online through Wizard's web site. We ordered them late enough that they'll only be available for pickup at the show itself. I suppose it will delay getting into the show a tad, but I don't expect to be there AS the doors are opening. Coordinate! Since I'm not flying solo at the con and I don't own a cell phone, I'm trying to do as much coordination as possible prior to actually leaving. This is mostly via email since we can exchange maps and whatnot. "I will be at this X at such-and-such time." This will obviously smooth things out across the board as expectations are set early on. "Well, if I'm meeting Joe at 1:00, that'll mean I'll be coming right out of the Superhero Costume panel, so we should probably just meet by the concession area and grab lunch." Remember that this is just my PRE-convention work and, in doing it all electronically, I can help ensure that my time at the show itself, as well as my time in preparing to leave for the show, are spent as efficiently as possible. I'm not trying to recall half-remembered creators whose names sound vaguely familiar, nor am I going to be rummaging through my long boxes trying to pull out comics I think a creator might've worked on. I've determined that I can probably skip a big chunk in the middle of the convention floor and not miss anything of great importance to me. I know the electronic tools are available, and I would just like to suggest that people take more advantage of them to make sure their convention-going experience is as pleasant as possible. Sean, this is pretty impressive. Realistically, though, I'd almost consider it essential for a one day visit to Wizard World. Place is heee-uge. This is much more advanced preparation than I had for my visit, several years back; I hope it pays off handsomely.